This post about the dog days of summer and great summer products for your pet is is sponsored by PetMate. I was provided with products in order to conduct the review. All opinions are 100% my own. Who says people can have all the fun this summer? PetMate has provided our sweet Chloe with some fun summertime toys and accessories to keep your pups entertained at cool during the dog days of summer. As usual Chloe has no trouble sharing her thoughts on the new PetMate products for summer. What dog does not love to play fetch? Even though summer nights are longer, our family stays up late, especially when we head to the beach. Now Chloe can have fun and we won’t worry about losing her balls. 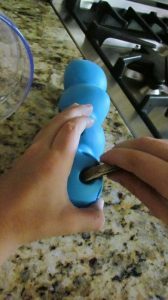 Check out the Chuckit! FireFly™ LED Ball allows for late-night fun. 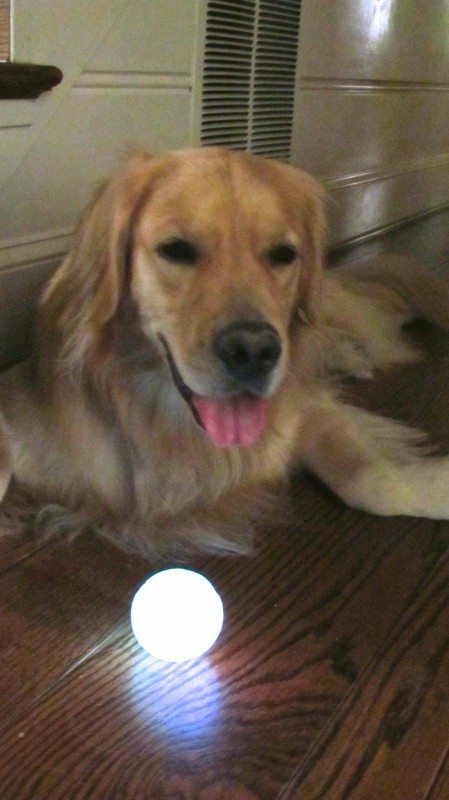 This ultra-bright, multicolor LED ball fades between colors, creating a constant motion helping dogs- and their playmate-keep their eyes on the ball. While summer can be a fun time for pets, Chloe especially with all her fur, hates the summer heat. 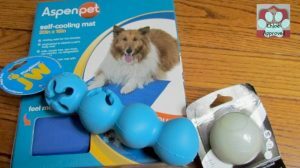 We were thrilled to have her try out the new Aspen Pet® Self-Cooling Mat. I was not sure what to think as the entire mat is 18×20 and for a full grown golden retriever this barely fits her tummy. 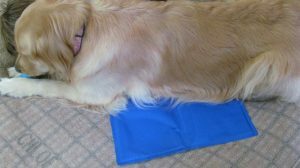 The Aspen Pet® Self-Cooling Mat conforms to ambient room temperature, keeping your dog cool and comfortable. The non-toxic cooling gel absorbs body heat and no water or refrigeration is required. Chloe is always looking for a cool place to lay her head in the summer, so we placed the mat on her favorite dog bed, and she seems to enjoy it. I can’t wait to bring it to the beach and put it on the porch there where she loves to sit and relax with the ocean breeze. Our family is more crazy busy in the summer and I have found we have been leaving Chloe at home more than during the school year. One way to keep dogs entertained in your absence is with PetMate’s JW® PlayBites™ Caterpillar. We watched Chloe play with this toy in attempt to get what she is most motivated by FOOD. The Caterpillar is designed to hold a variety of treats and excite canine senses. I think we will also try this on our next road trip to keep the dog busy. So don’t let the dog days of summer pass by without thinking about your beloved pups. She may be hot this summer but she is happy. thanks richard, Chloe really has enjoyed these dog toys this summer so far. Lots of nice toys for the dog. I love to keep our dog active with them. No dog here, but they look like great stuff for dog owners! Kingers would love the chew toy with treats and the cooling mat – he often lays on the fireplace hearth during the summer. We could use the cooling mat for our lady! She is getting older and really has a hard time staying outside very long. She would love it! That caterpillar would definitley keep my dog for hours (I hope)!! I would love that cooling mat. We moved to NC from NY 4 years ago and my Izzy (the dog) has been panting ever since. She is forever off her beds onto the hardwood floors getting cooler. I am definitely looking into that. So nice of you to share. I bet our dog would love these! Of course she’s a bit older and doesn’t play much but maybe to chew on or look at? One of my friends just bought a cooling mat for their dog. Their dog loves it! They have a small dog though. I need to get that caterpillar for my Great Dane. I bet he would love it and hopefully it would keep him entertained. What neat products! We don’t currently have any pets, but my kids keep begging for a dog. I will have to keep these in mind if we ever break down and get one. You dog is adorable! My Newfoundland would have loved that cooling mat in the summer! When we had dogs, we used to have treat keepers like that for when we would be gone at work. It helped keep them occupied for part of the time we were gone. this looks amazing and like something i will definitely be trying! Those look great, great to keep them busy! Love the ball that lights up! Chloe is beautiful! Looks like she’s lovin her products! Those are great products for pets. That cooling mat looks interesting.